Now 4 days on the identities of the terrorists are becoming known and as I expected in the hours following the attacks that most of those responsible would likely turn out to be French nationals, 7 dead and at least 1 on the run. The attacks have galvanised much of the worlds major militaries to come together to destroy Daesh / Islamic State and will likely succeed in doing so, though without peace in Syria the IS void will immediately be filled by another death cult, remember that despite the worlds focus on Islamic State, Al-Qeeda has not gone away. So the only thing that will halt Syria being the crucible for terrorism will be when the Syrian void is filled by a real effort to bring peace to Syria. ISIS / Islamic State were destined from the very beginning for ultimate demise for the fundamental flaw in their logic is that they truly believe that they are bringing about Islamic Prophecy as written in the in the Hadiths and Koranic texts of the key steps necessary along the path towards 'End Times'. In pursuit of which they perceive anyone who does not follow their interpretation of Islamic doctrine as not really being muslim and thus to be killed, which is why the vast majority of people killed by IS have been muslims for not being muslim enough. Frances North African Colonial Wars - France for several decades has been engaged with boots on the ground wars right across its North African former colonies from Libya to Mali to Chad to Mauritania and then started bombing Islamic State in Syria in September. Therefore, Frances current military campaigns have acted as focusing the attentions of numerous Jihadists to target France that in their view (and in many others) in engaged in wars of colonial imperialism. 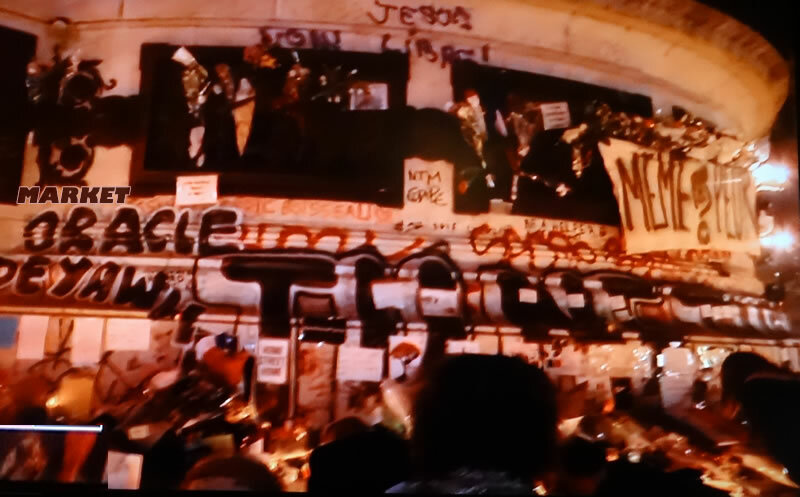 So it should not be forgotten that France has a LOT of African blood on its hands that probably number in the several millions of dead and quite recently at that (Algerian war of independence 1962), memories of which the peoples of Africa have not forgotten. Therefore the terror attacks on France are not out of the blue, but the seeds of which France has been fermenting for several decades in its colonial wars across Africa that continue to this very day. Though of course similar could be said of all former colonial powers who are engaged in military action today. And it should not be forgotten that today's crucible for terrorism has its roots in the US / UK decade long War on Iraq that laid the ground work for the emergence of first Al-Qeeda in Iraq and then ISIS, amongst probably a thousand other smaller factions. Migrant Crisis and Schengen - As part of the Schengen area, France unlike Britain has very porous borders as effectively France and all of the Schengen countries have out sourced their border controls to states such as Italy and Greece who have been overwhelmed by the weight of numbers flooding into Europe that will total near 1 million this year, of at least several hundreds if not several thousands of whom will be Syrian and Maghreb Jihadists intent on terrorist operations within Europe for which the prime targets are the likes of France and Britain. In fact it is becoming apparent that the Paris terror attacks were planned in Syria and assembled in Belgium so that they would fly under the radar of the French security services, whilst at the same time could execute their terror plans with ease due to the lack of internal border controls. Another consequence of the open borders is the ease to which deadly weapons such as klashnikovs can flow from eastern europe into France via established criminal networks. And given the likes of the burka ban, rise of the French far right then France is clearly trending towards a deepening rift between French muslims and the rest of French society. That point is this when French muslim youth are rejected by the country that they were born into then they are far more susceptible towards being radicalised, turning towards the likes of Islamic State's welcoming and prophetic ideology of brotherhood and martyrdom. French Jihadists - France has sent near 1,500 radicalised Jihadists to Syria of which approx 1/5th have returned, who have effectively been hyper-radicalised and trained to potentially wreck havoc across France and Europe which is why there is a real risk of another major attack in France, as there exists a pool of as many as 300 hyper-radicalised Jihadists programmed for one a way trip to paradise. 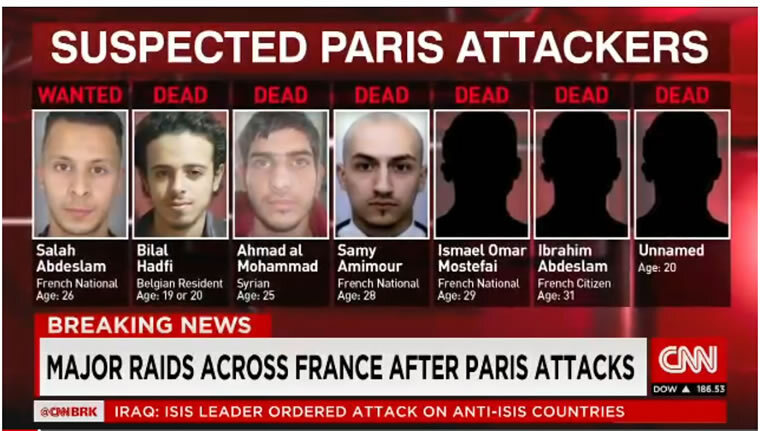 Therefore one of the key strategies of ISIS is to commit such atrocities that it will engender a further backlash against large minority muslim populations such as in France and right across Europe, thus increasing the propensity for more muslim youth to become radicalised towards ISIS''s apocalyptic agenda and sowing the seeds for much civil conflict in nations such as France that feeds on existing prejudice and discrimination that arabs in France tend to experience on a daily basis and elsewhere in Europe. 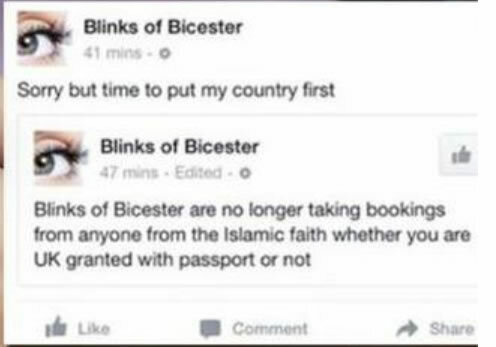 For instance there have been a string of anti-muslim attacks right across Europe which range from the criminal to the discriminatory as illustrated by the following Facebook post of a UK hairdresser no longer wanting to "take bookings from anyone from the islamic faith whether you are UK granted with passport or not"
It is through a myriad of discriminatory acts such as this that play into the hands of ISIS as being the initial instances for radicalisation of muslim youth. Whilst especially the right wing mainstream media may be focused on the threat Islam poses to the West, the reality is the exact opposite as I have countless times written of over the years in that the likes of ISIS / Islamic State represent the death pangs of a dying religion rather than being a threat to the West. Just as some 500 years ago Christianity literally went medieval on all those whose beliefs contradicted Christian doctrine, committing many to imprisonment and many more to death, including prominent scientists such as Galileo, all because they would make statements such as that the Earth is not Flat or not at the centre of the universe. And so it is for Islamic State and others such as the regime in Saudi Arabia, who are Islam's versions of the Spanish Inquisition, desperately attempting to reinforce a crumbling Islamic view of reality that is fast disintegrating in the face of a flood of enlightenment that muslims tend to become exposed to as they educate themselves. The inconvenient truth is that most muslims in the West are NOT practicing muslims, instead are culturally muslims i.e. as most Christians in the West are not practicing Christians as evidenced by the fact if Jesus Christ ever was to return during December his first words would likely be 'WTF?' when he sees the Christmas trees, lights, partying and month long shopping sales frenzy in the cathedrals of consumerism, all in his name. 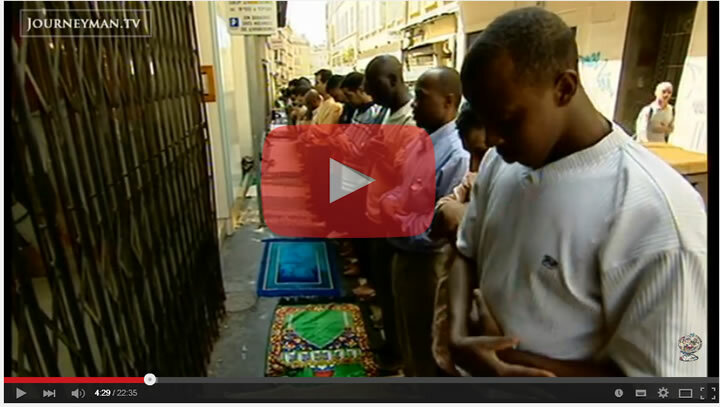 Similarly Islam, at least in the West for most muslims has become a religion of just going through the motions of rituals, customs and celebrations. So in reality 60% of western muslims are NOT practicing muslims with even a good 1/5th of muslims in muslim countries tending only to go through the motions of being muslim i.e. that in reality, deep down don't really believe anymore but just go through the motions for keeping up appearances in a case of 'the emperor has no clothes'. And the same holds true for all major religions, Judaism, Christianity, Hinduism etc, all to varying degrees in the violent death pangs of dying religions. For instance even the most diehard Islamist's, the Saudi's are routinely exposed as being hypocrites, drinking and partying in secret whilst publically prancing around in white robes, preaching to the ignorant, uneducated masses in other third world muslim nations to do this that and the other in the name of islam which they don't tend to practice themselves. And it is that which the likes of Islamic State are a reaction to i.e. the death pangs of a dying religion, desperately trying to reinforce ideology over reality Spanish Inquisition style existing in voids such as Syria. My recent article (12 Nov 2015 - UK BrExit Referendum as European Union Faces Migration Catastrophe) pointed out the fundamental issue of continuing out of control immigration that has been the key driving force for triggering the UK EU referendum, and not just of the mass migration from Eastern Europe but also Europe's porous Schengen borders that this year alone will see 1 million illegal migrants enter the EU, free to then move across Europe and contributing towards creating the ever expanding bottleneck at Calais. My earlier article had already voiced that the EU was destined to eventually backtrack on Europe's open internal borders and therefore naturally move someway towards Britain's position over the coming years, thus allowing David Cameron to claim victory and deflate some of the driving forces towards a BrExit. Today's debate surrounds whether Britain will vote to Leave the European Union or not, primarily so that the UK can control its borders in the wake of over 15 years of out of control immigration. However, given the time-frame for implementation of BrExit following an Referendum Vote to LEAVE the EU then such negotiations would likely continue for several years. That's possibly five more years of not only net migration into the UK ratcheting ever higher as net migration in the 300,000's gives way to the 400,000's, but rather even the likes of Germany and Sweden are already showing early signs of panic and it won't be too many years when they too attempt to slam their doors shut to ALL migrants, even those from within the EU. 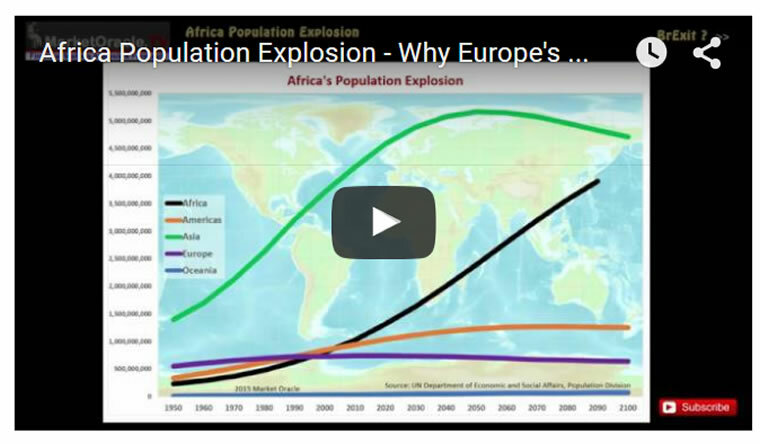 So by the time the UK has finally exited the EU, say by 2021, then the Europe of that day would no longer resemble the open borders of the Europe of today as by then member states in large numbers will have awaken to the real magnitude of the potential for an exponential migration crisis that will worsen year by year, decade by decade. There are already signs of panic in the air, as at today's Malta Summit of 60 EU and African heads of state has the EU desperately attempting to bribe African nations to take some of their migrants back with 1.8 billion euros. Which is just not going to work, as probably most of the Euros will be funneled into the back pockets of corrupt African politicians. The Paris terror attacks have acted to bring home the reality to European Union member states that Schengen open internal borders do not work where migration and terrorism and crime are concerned, and thus the Paris attacks could be the nail in the coffin for Schengen which will thus further dissipate pressure for an BrExit as it is likely that Schengen will be permanently suspended probably within the next few weeks. Therefore the Paris terror attacks strengthen David Cameron's hands where EU negotiations concerning the movement of peoples, thus further increases the probability that Britain will vote to remain within the European Union as I concluded before the Paris Attacks. This despite my view being that Britain would be better off outside the European Union, and given what is likely to transpire over the coming decade will probably hold a second referendum in just over a decades time. Ironically it is Europe that would be the main loser following a BrExit, plunging Europe into an economic and social crisis that will likely prompt other northern nations to also exit the EU. The bottom line is that today's migration crisis is the mere tip of the Africa population explosion ice-berg that will make itself increasingly felt with each passing year, pushing Europe slowly in the direction of Britain's stance that I am sure will be claimed by David Cameron as a negotiation victory when the movement will likely have happened anyway. Therefore, this suggests a later referendum date is more favourable for a REMAIN in the EU vote as that is likely to see more EU member state border controls imposed, which coupled with recent opinion polls in favour of staying in the EU of 55% to 39%, then the most probable outcome appears to be that the UK will vote to remain within the EU. Though the UK may come to regret such a decision a decade on which may prompt a second referendum.